Mahatma Gandhi full name was Mohandas Karamchand Gandhi. He was born on 2nd October 1869 at Porbandar in the present state of Gujarāt . Gandhi was the architect of India’s freedom and one of the greatest men of this century. He was renowned for his courage and determination. Gandhi’s life was dedicated to ideals of truth, non-violence and love. He was killed by a fanatic in 1948. 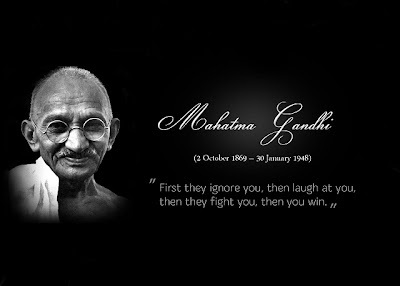 Below are some famous quotes that were quoted by Gandhi during his lifetime. Man's nature is not essentially evil. Brute nature has been know to yield to the influence of love. You must never despair of human nature.